This is a list of state parks and state historic sites in Missouri. 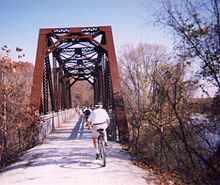 In the state of Missouri both state parks and state historic sites are administered by the Division of State Parks of the Missouri Department of Natural Resources. As of 2017 the division manages a total of 92 parks and historic sites plus the Roger Pryor Pioneer Backcountry, which together total more than 200,000 acres (81,000 ha). According to the state, its parks system includes approximately 3,500 campsites, 194 cabins, and 1,000 miles (1,600 km) of trails, including the longest developed rails-to-trails project in the nation. ^ a b "About the Missouri State Park System". Missouri State Parks. Missouri Department of Natural Resources. Retrieved October 8, 2014. Wikimedia Commons has media related to State parks of Missouri.